A knowledge graph encodes many facts, each through the use of a directed edge. Each vertex can have many facts connected to it, making this ultimately a directed multigraph. This type of representation provides an intuitive way to reason about queries. 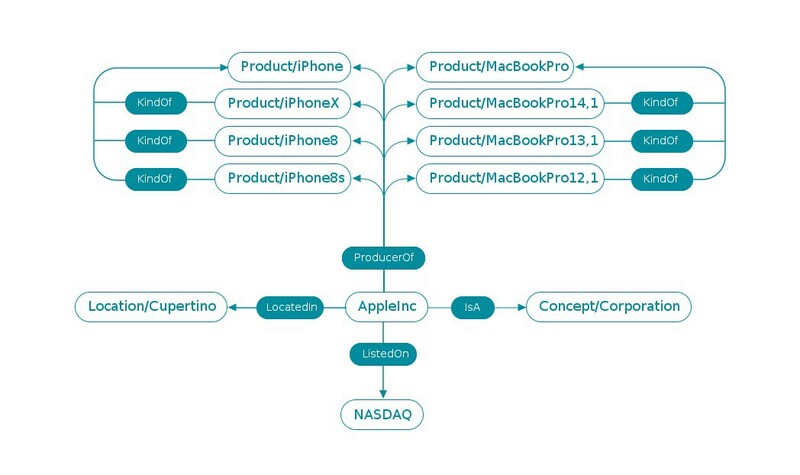 For example, from the knowledge graph represented in Figure 1 we can reason about the question “Is apple a company?” by simply walking through the graph, starting at “Apple” and walking to “Company”, testing edges and concepts along the way. In production, knowledge graphs tend to be quite large and complex with millions or billions of edges. 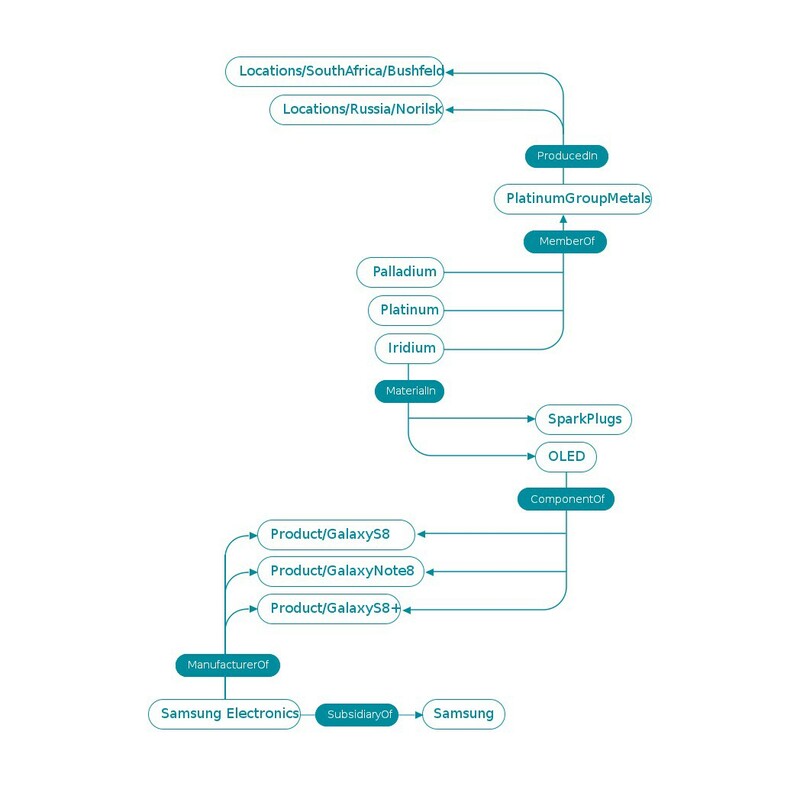 uch a large amount of knowledge allows us to use these graphs to easily reason about semantic connections for tasks such as enriching business relevant data and resolving entities. At Forge.AI, we perform these tasks as part of our NLP/NLU pipeline for extracting individual events from unstructured text into a machine-readable format. With a working definition of a knowledge graph in hand, we will next explore some of the use cases that we’ve found for the knowledge graph here at Forge.AI. Then, we’ll explore the graph infrastructure to understand what powers these use-cases. Finally, we’ll discuss part of our road map to explore what’s next for Forge.AI and its knowledge graph. It’s worth grounding our conversation of the knowledge graph in a few use-cases before we jump too deeply into a detailed discussion of the infrastructure, how it works, and where we’re going. In general, a knowledge graph can be used for a wide range of applications including entity resolution, dependency analysis, filtering, and machine reasoning. In the ensuing discussion, we will focus on entity disambiguation and dependency analysis, two of the many tasks that we use the knowledge graph for at Forge.AI. Obviously, this is “Apple” the corporation, not “apple” the type of fruit. How did our brains determine this? We used contextual clues! We know that the Apple Corporation sells the iPhone because the type of fruit is incapable of selling anything. Based on these contextual clues alone, we are able to perform this task nearly instantaneously using our reasoning.The ForgeAI knowledge graph works in the same way: when we seek to disambiguate an entity, we provide the knowledge graph with a set of co-located entities that provide the graph with the appropriate context. However, machine learning systems do not work like our brains do and for a machine learning system to reason with context, we need a knowledge graph. Our knowledge graph then searches for all versions of “Apple” on the full graph and constructs small graphs that include contextual information as can be seen in Figures 2 and 3. Note, this is a noisy string search that is capable of finding versions of the initial search term that may differ from the original string or contain the search string as a substring. We also keep a look up table of known aliases for each of our entities, where aliases can be things like CIK codes or ticker symbols. It’s certainly not obvious to me how this story is connected to Samsung. The question at hand is to determine whether this news event is related to Samsung and, if so, the nature of that relation so we can determine whether or not to pass this event to our customer. We begin by constructing small graphs around each of the entities. With these graphs in hand, we then compute a path given Dijkstra’s algorithm between each of the marked endpoints. An example of such a path is given in Figure 4. This type of dependency analysis is illustrative of the power of a well formed knowledge graph and it is critical for machine enabled semantic reasoning. It’s easy to imagine this type of dependency analysis having uses not only in the financial services industry, but also in work as wide ranging as supply chain risk assessment and nuclear nonproliferation applications — just to name a few. There are a small number of facts that I’d be willing to bet my life on — something like Auston Matthews is a Toronto Maple Leaf — and a great many facts that I’d be willing to bet $20 dollars on — for example, the Boston Massacre happened in 1770. Both are true but, due to the amount of information that I’ve recently read, I know considerably more about the former than the latter and, therefore, am more confident about it. Motivated by this, we have designed our knowledge graph such that each edge has weights which we choose to interpret as confidences. This data enables us to capture the inherent uncertainty necessary to model a fast changing world and to reason about the validity of queries. By virtue of the graph being probabilistic, we are able to embrace true Bayesian reasoning as we attempt to evaluate a query, as well as provide query specific priors to up or down weight an assertion based on the origin (e.g. a company’s own statements about a new product release should be up-weighted over twitter rumors). We also have a clear route towards efficient parallelization by exploiting what we are terming the “galactic structure” of the graph. While this is not a general feature of all graphs, we have observed that there are highly connected clusters of vertices that are only weakly connected to one another. Intuitively, this makes sense. For example, consider domains such as the Toronto Maple Leafs and modern particle physics — there is little overlap between these fields and therefore no need to reason over a graph that contains both clusters of highly interconnected vertices when reasoning about Dave Keon, the Toronto Maple Leafs legend. This galactic structure provides us with a promising route towards efficient parallelization using commodity hardware. We’ve just started to teach the knowledge graph and show it how to perform basic reasoning. The following are some of the many additional features that we are adding that will ensure the accuracy, robustness, and efficiency of the graph long into the future. Of course, if we have a collection of facts that we intend to use as our internal source of truth to augment business data, we should ensure that this set of facts is correct. With our current knowledge graph size, we can perform this fact checking using a mix of manual spot checking and axiomatic constraint testing (e.g. a person can only be born in one country). This is the standard technique for evaluating the correctness of knowledge graphs. As with most machine learning tasks, this is incredibly person intensive and, therefore, expensive. Additionally, it’s difficult to scale this technique to large graphs. To address these issues, we’re excited to explore techniques related to hinge-loss Markov random fields that are directionally aware. In addition to being efficient, this allows us to look at a fact such as “Florida namedAfter Flo Rida” and swap the directionality, instead of having to first infer that we need to delete this edge and then infer that the reverse edge should be present. Because it’s simply not possible to have humans continually teach the knowledge graph, our system is being constructed to be capable of learning facts on its own. There are many ways to do this including: tracking unexplained queries, generalizing local and global graph features to infer new facts from patterns, and using semantic information. Intuitively, this might look like finding patterns such as “Companies tend to have a CEO” and one of the companies in our graph does not currently have a CEO. Therefore, we should enrich this region of the graph specifically relating to the specific company and the existence of the CEO. To achieve this, we are actively exploring modifications of techniques such as the path rank algorithm and graph embedding methods as well as information retrieval techniques from the internet and other sources. This is proving to be an exciting path of inquiry. Modeling the influence of specific edges on the connectivity of two marked vertices in a graph is fundamental to understanding network resilience. In the context of a knowledge graph, this provides us with information about the influence of this fact. Intuitively, if we imagine that the vertices in our graph are cities and the edges roads, with the edge weights corresponding to the width of those roads (e.g. 0.1 is a one lane road and 1.0 is a 6 lane super highway), then the time to travel between two different cities indicates the strength of their connection. With many alternative routes and many wide highways, we can say that those cities are tightly connected. Mathematically, the problem can be thought about in terms of a two point correlation function for a collection of random walks over the graph. These are discrete random walks whose dynamics can be modeled with a discrete Green’s function. By taking advantage of the connection between discrete Green’s functions on a graph of random topology and discrete Laplace equations, we’ve preliminarily found that it is possible to evaluate the influence of changing an edge. We’re excited to formalize and harden this connection and expose these measures to aid in producing more advanced models.